Friday November 25th 1881. I went to town this morning and soon as I got back Mother started to the valley she did not come home tonight. I knit on some double mittens all the afternoon and evening. The boys helped after they came from the office and we hung some new pictures in the dining room. Father got home from Washington Co tonight where he has been since Monday. Orrie went in the country to a party. 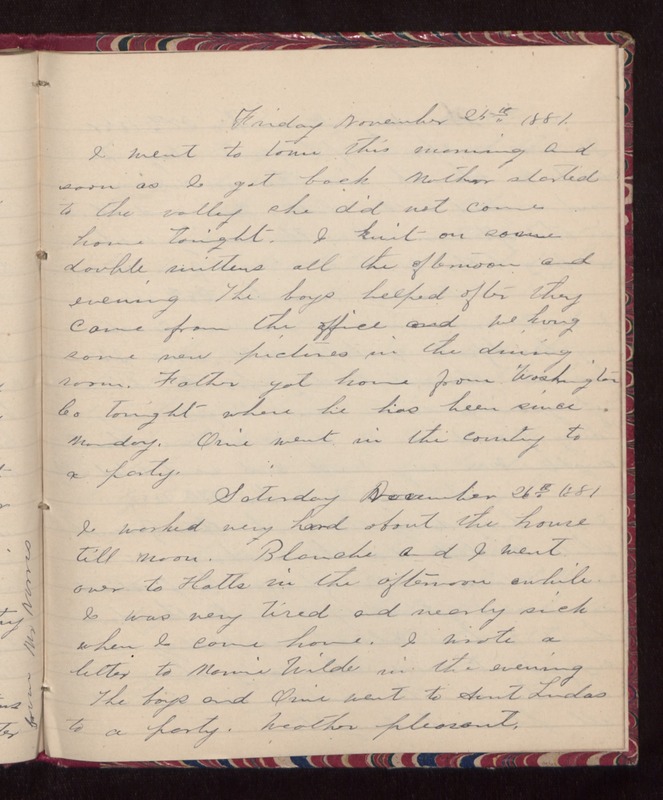 Saturday November 26th 1881 I worked very hard about the house till noon. Blanche and I went over to Hatts in the afternoon awhile. I was very tired and nearly sick when I come home. I wrote a letter to Marnie Wilde in the evening. The boys and Orrie went to Aunt Lindas to a party. Weather pleasant.